Having won the South Pacific Trophy team event in convincing fashion at Audi Hamilton Island Race Week two years ago, the New Zealanders are returning as defenders this year with all guns blazing. Four of that country’s best performing offshore racing yachts will be at Race Week, and all are vying for a place in the three-yacht team that will be out to repel the Australian challenge. The same yachts will also be targeting top honours in the Audi IRC Australian Championship, which will be decided at the series scheduled for August 17 to 25. Of the 68 yachts already entered for Audi Hamilton Island Race Week 2012, half have nominated for the Cruising and Non-Spinnaker Cruising divisions. On current projections the final fleet should be around 200. The elite line-up of Grand Prix level yachts from New Zealand comprises Jim Farmer and Chris Mead’s highly competitive 52-footer, Georgia; the TP 52 Kia Kaha (Chris Hornell); Connel McLaren’s very competitive Ker 40, Ice Breaker, and the Reichel Pugh designed 42-footer, Rikki, owned by kiwi yachting legend, Ray Haslar. Experts agree that no matter which three yachts the New Zealanders select for their team to defend the South Pacific Trophy, it will be a formidable line-up. The make-up of the Australian team has yet to be considered, however, Audi Hamilton Island Race Week Race Director, Denis Thompson, said he expected the three Australian yachts to be selected by a committee to be formed by Hamilton Island Yacht Club. The South Pacific Trophy will be awarded to the team that accumulates the most points during the week of racing. The series will comprise races that round many of the beautiful tropical islands that surround Hamilton Island, plus a distance race of approximately 60 nautical miles and a series of short windward-leeward sprints. Preparations for what will be the 29th staging of this famous regatta are well in hand, especially when it comes to the entertainment and catering for the competing sailors. Some great bands will keep the waterfront party atmosphere alive each night, and apart from the many restaurants that will serve a wide range of delicious food, ‘Eat Street’ will again be established on the edge of the harbour to provide low-cost outdoor dining. 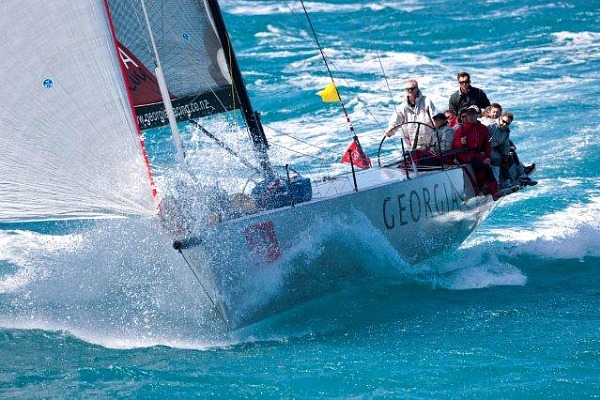 All information relating to Audi Hamilton Island Race Week 2012 is on the regatta website – www.hamiltonislandraceweek.com.au. The Notice of Race and Entry Form are also on the site. The regatta caters for the full spectrum of keelboats – from non-spinnaker cruising yachts and sport boats through to Grand Prix level racers and high-performance multihulls. Luxury carmaker, Audi, returns as the main partner of Hamilton Island Race Week in 2012. The German premium brand offers a range of special events on the island for yacht owners and guests to enjoy during the week.